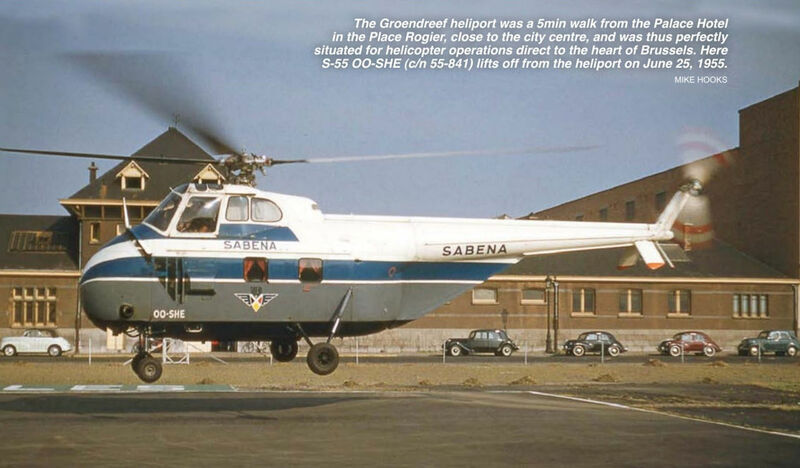 The Groendreef heliport was a 5min walk from the Palace Hotel in the Place Rogier, close to the city centre, and was thus perfectly situated for helicopter operations direct to the heart of Brussels. Here S-55 OO-SHE (c/n 55-841) lifts off from the heliport on June 25, 1955. 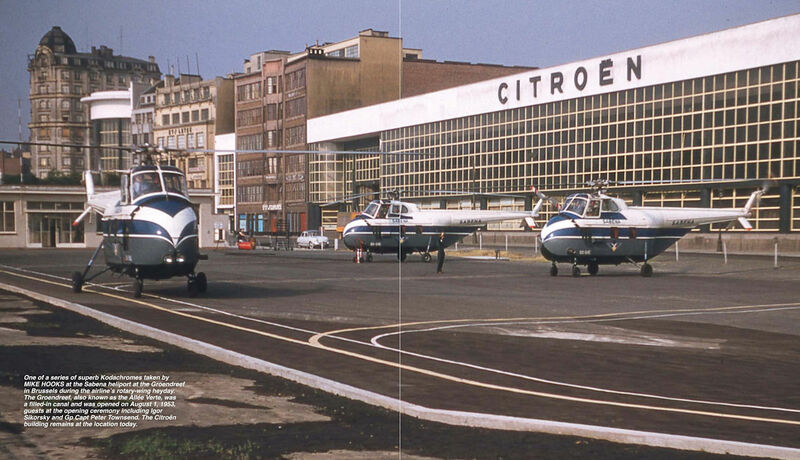 One of a series of gorgeous Kodachromes taken by MIKE HOOKS of Sabena Sikorsky S-55s in Brussels in 1955. Seen here departing the heliport at the Groendreef in June 1955, Sikorsky S-55 OO-SHF (c/n 55-842) was one of six purchased new from the United Aircraft Export Corporation during 1953-55, and arrived in Brussels on March 3, 1955. It was sold to the French government in March 1957 to become F-SFWR, but was immediately put into service with the Armee de l'Air as 55-842. 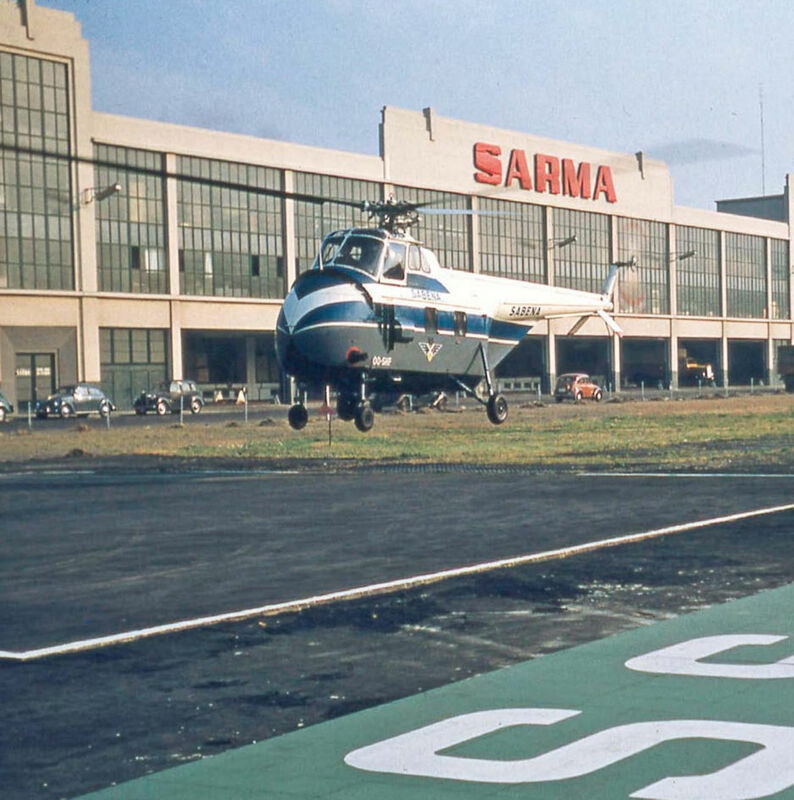 One of a series of superb Kodachromes taken by MIKE HOOKS at the Sabena heliport at the Groendreef in Brussels during the airline’s rotary-wing heyday. The Groendreef, also known as the Allee Verte, was a filled-in canal and was opened on August 1, 1953, guests at the opening ceremony including Igor Sikorsky and Gp Capt Peter Townsend. The Citroen building remains at the location today. 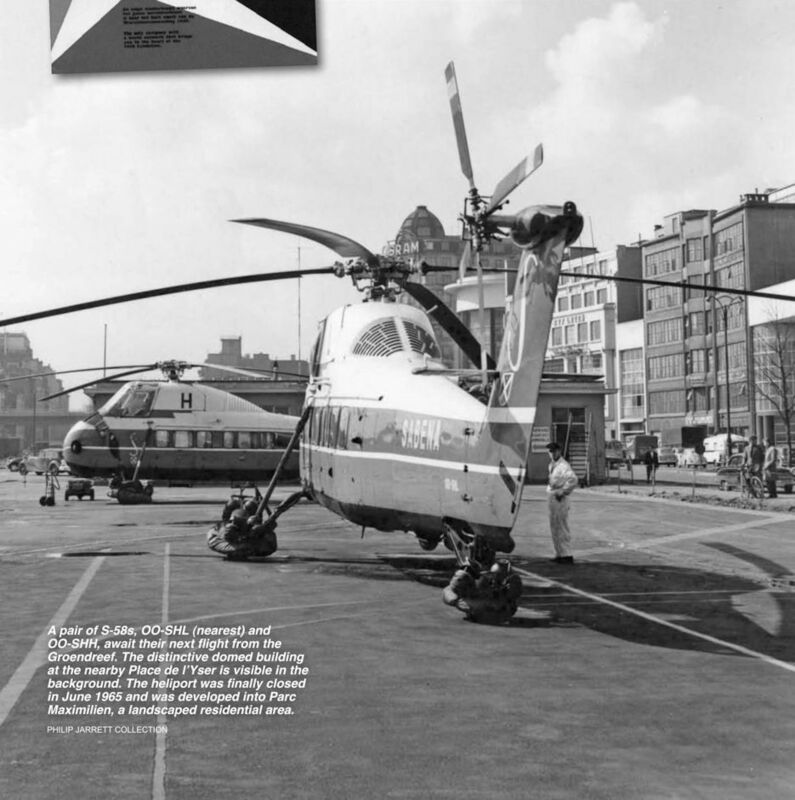 Two of Sabena’s leased helicopters, a Vertol 44A and Widgeon, at the exhibition helipad during Expo ’58. 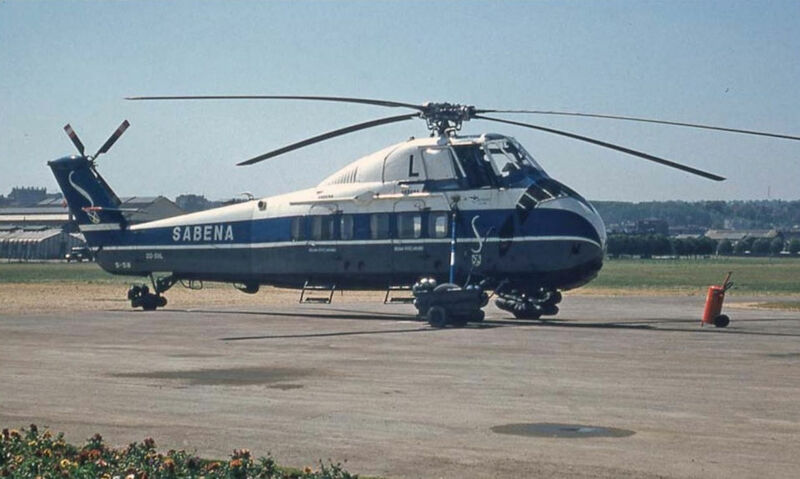 During 1956-57 Sabena replaced its S-55s with the faster and larger S-58, OO-SHL (c/n 58-388) arriving in Brussels in early January 1957. 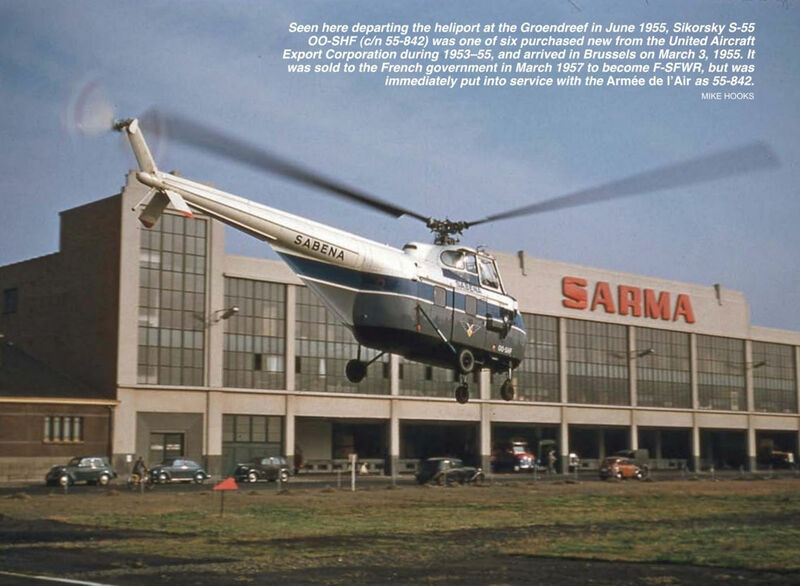 It is seen here in June 1958 at the international airport at Melsbroek/Zaventem, six miles (10km) north-east of the heliport, and where the Sabena helicopter fleet was officially based and maintained. A pair of S-58s, OO-SHL (nearest) and OO-SHH, await their next flight from the Groendreef. The distinctive domed building at the nearby Place de l’Yser is visible in the background. The heliport was finally closed in June 1965 and was developed into Parc Maximilien, a landscaped residential area. 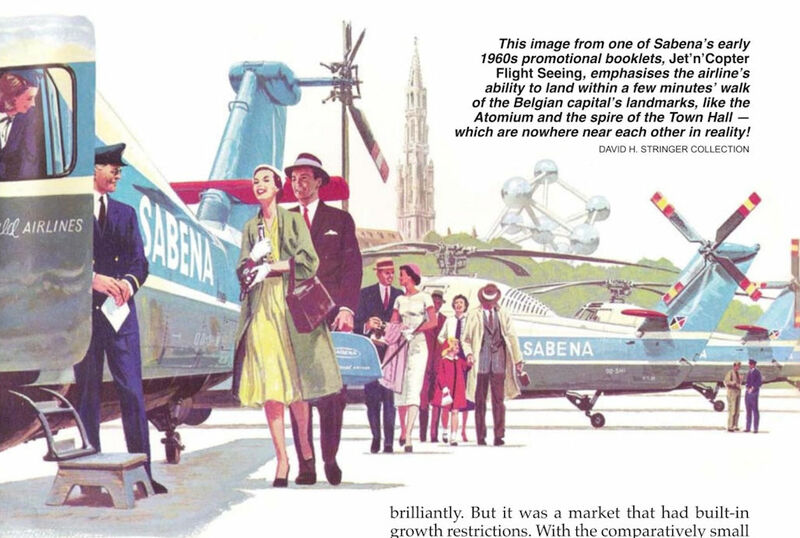 This image from one of Sabena's early 1960s promotional booklets, Jet’n’Copter Flight Seeing, emphasises the airline’s ability to land within a few minutes’ walk of the Belgian capital’s landmarks, like the Atomium and the spire of the Town Hall - which are nowhere near each other in reality! Sporting the Expo ’58 star logo on its nose and Sabena colours, Westland Widgeon G-ANLW served with the airline for the duration of the exhibition. It later went on to appear in some dynamic flying sequences in the obscure 1974 film Caravan to Vaccares. It is now on display at the Norfolk & Suffolk Aviation Museum at Flixton. 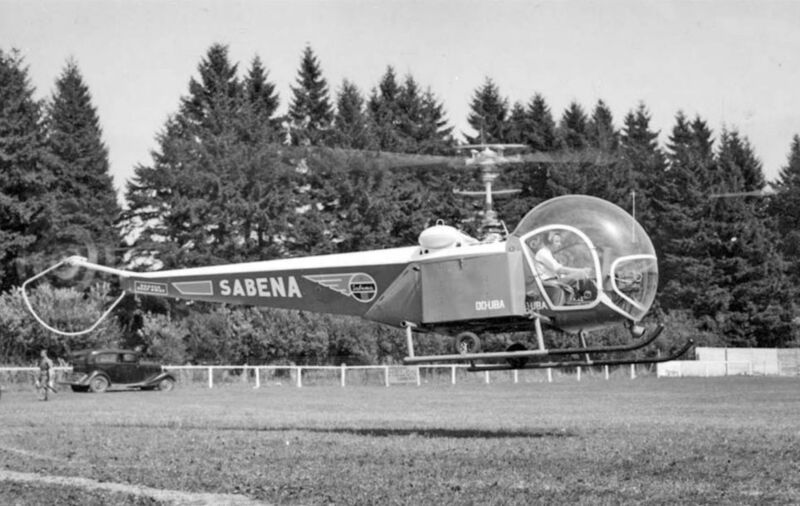 The first of Sabena’s helicopters, Bell 47D OO-UBA (c/n 179), was used for the airline’s postal service from 1950, and was re-registered as OO-SHX in 1952. It was sold in 1954 to a new owner in Sweden, where it was registered SE-HAI. It later went to India, where it became VT-DVT. It was destroyed in a non-fatal fuel-starvation incident in February 1969. Sud-Est Alouette II OO-SHV at Melsbroek/Zaventem in the mid-1960s. After operations with Sabena in Africa and Europe, it was sold to the Israeli Air Force in January 1968 and served with the latter’s 125 Sqn as “014”. It was finally withdrawn from service in May 1975.